The main thrust of the piece is that an independent air-crash expert, Larry Vance, has looked at photographs of the Réunion flaperon and decided that their relatively intact state, and the lack of debris from inside the aircraft, means that the plane must not have impacted the water at high speed, as would be expected if the plane ran out of fuel as a “ghost ship” and spiralled into the water. He interprets the jagged trailing edge of the flaperon as evidence that it was deployed at the moment of impact and was worn away when it struck the water. I find it discomfiting when people say that the mystery of MH370 is not mystery at all–that they are absolutely confident they know the answer. Vance undercuts his credibility, I feel, by taking this stance. There is indeed a strong argument to be made that the plane must have been under conscious control to the very end; to me the most compelling is simply that the plane has not been found in the current seabed search zone. However it is less clear that someone attempted a ditching. What the show does not mention is that debris from inside the aircraft has indeed been found, suggesting that the fuselage could not have survived the impact and sunk to the bottom of the ocean intact. Indeed, the program doesn’t mention the other debris at all, with the exception of the Pemba flap, which is the other relatively intact large piece. The fact that most of the debris found so far is rather small is to me indicative of a higher-energy impact. But I have no strong opinion one way or the other; I feel that proper experts must look at the debris close up to determine what forces caused it to come apart. Note that the numbering systems for the two data tables do not match. (Please do not ask me to explain this.) 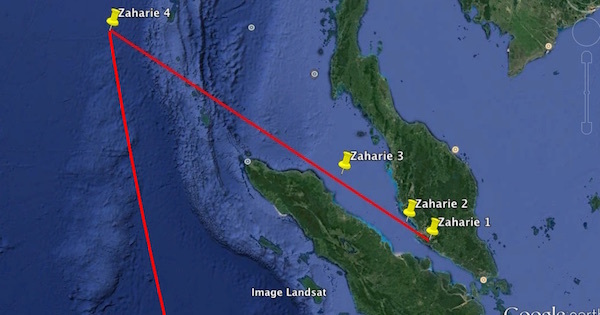 I suggest that for the purposes of discussion, the point saved at Kuala Lumpur International Airport be called point 1; the three points recorded as the flight-sim moved up the Malacca Strait to the Andaman Islands be called 2, 3, and 4; and the points over the southern Indian Ocean with fuel at zero be called points 5 and 6. 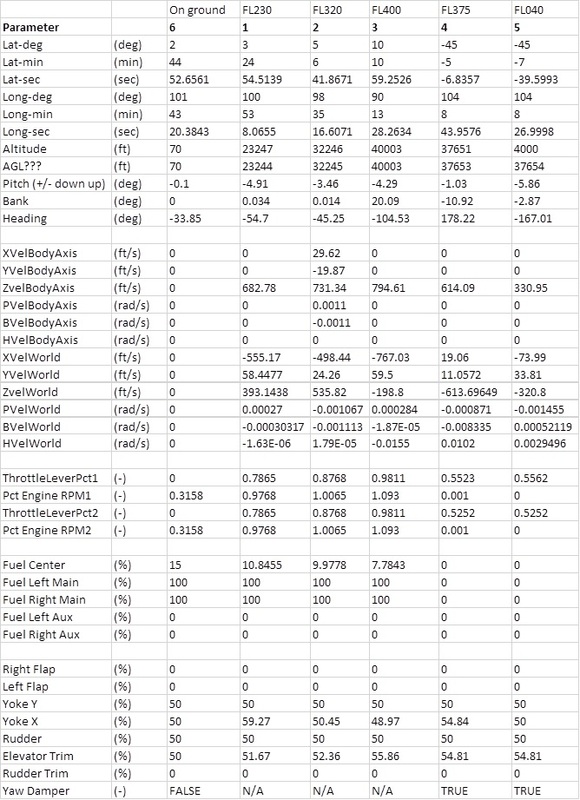 In order to understand the fuel load numbers in the second table, I made some calculations based on the fuel loads in a real 777-200ER. I don’t know how closely these match those in the flight simulator Zaharie was using. If anyone can shed light I’d be happy to hear it. Worth noting, I think, is that the fuel difference between point 4 and point 5 is enough for more than 10 hours of flight under normal cruise conditions. The difference between these points is 3,400 nautical miles, for an average groundspeed of less than 340 knots. This is peculiar. 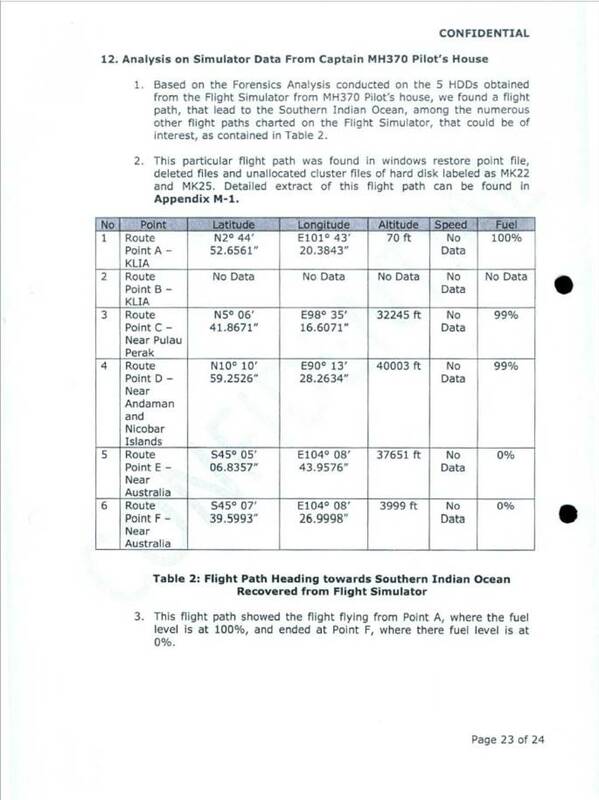 Perhaps the flight-sim fuel burn rate is very inaccurate; perhaps the simulated route between the points was not a great circle, as shown in the second page of the report above, but indirect; perhaps Zaharie was fascinated by the idea of flying slowly; or perhaps points 5 & 6 come from a different simulated flight than 1 through 4. Readers’ thoughts welcome. 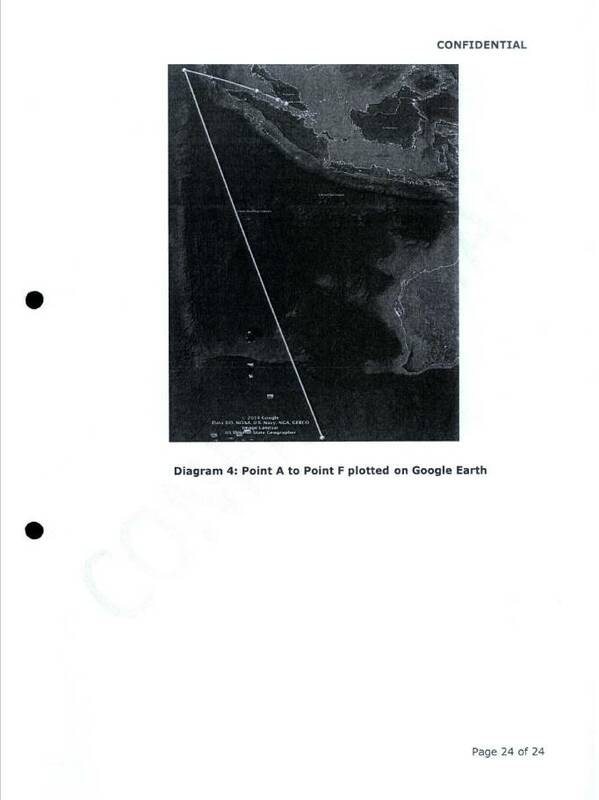 Also note that neither the locations nor the headings of points 1-4 lie exactly on a straight line from 1 to 4, which suggest perhaps that the route was hand-flown. Interesting comment on the 60 minutes programm from Michael Exner. IMO it’s still too early to take a firm position one way or the other. I think we have to await the ATSB report on the Pemba-piece at least. Be aware, that damage on the Hudson A320 was also caused post crash by rescue boats, by towing the mostly submerged aircraft to the dock and by hoisting it out of the water. Yes I thought of that too and looked at it. It sure suffered some damage too from the boats, towing and lifting. But those particular damage on the outboard flap and aileron are more likely explained by the ditching itself IMO. @Ge Rijn. There are assertions in the Exner article which lack balance or, as in para 6, become fact, and weaken the theme. “…it is difficult to imagine how the flaperon and flap segment could have survived the main impact without completely disintegrating…”. Not so difficult to imagine it, even if in fact it did disintegrate. To remind, part of an outer flap from MH17 did, when the aircraft struck the ground. Not even its trailing edge separated. Also, if the flaperon separated in flutter its hinge and PCU (actuator) attachment remnants should disclose fatigue failure of at least one attachment. There has been no hint from the French of evidence of fatigue leading to such separation or to the flaperon’s trailing edge fracture, at least that I have heard even though we have had leaks. With the centrality of that as evidence of high speed flight they would not have been remiss to withhold that from the accident investigators, but derelict. I think there is a fair prospect there is no such evidence. The part flap separation might be more difficult given the corrosion at the main break, the carriage, though the trailing edge damage might give clues. Pending that and flaperon disclosures it all remains conjectural. “Vance’s statements on 60 Minutes have caused great harm to the search for the truth about what happened to MH370.” Great harm? He has his views as do Bailey and many others. Surely they are at worst a distraction, at best an alternative view? –	“…..once the fuel is exhausted, the hydraulic power that would damp the flaperon’s motion is lost, and it would be expected to flutter at a high rate (perhaps 10-20 hertz) until failure. Look up the Boeing manuals, folks”. No. This is the sort of “utter buffoonery” he attributes to “60 minutes”. The Boeing manuals will not help. It would not “be expected to” flutter like that. It MAY. With the RAT deploying automatically there will be hydraulic “damping” of that flaperon via its outboard actuator. Even without that, confidence in this assertion without the flaperon on hand would require Boeing analysis and test tunnel data. Does he mean flutter would separate the flaperon trailing edge, the remaining part of it or the whole? To which would the ‘perhaps 10-20 Hz’ apply? –	He claims early identification of phugoids based on a description of a simulator run. The description contains, “The APU tried an auto restart but failed [ – – no fuel]”. He does not realise that this simulator run, if representative and not cherry picked, would undo the entire foundation for the 7th arc log on. That requires an APU run of at least two minutes. ventus45 Posted July 31, 2016 at 5:18 PM: “And what about Appendix M-1 ? What about all the other Appendix A to M, one or more for each ? How about Appendix N, O P Q etc ? How about Attachments and Enclosures ? A mountain of data was gathered from FIVE hard disks. There is much more the Malaysians are sitting on. I’m confident the remaining data will contain wind data, and thereby disprove any far-fetched misrepresentation of the data in the table of subsets that Jeff posted above. … but you still have a long way to go. Only a comparison with MH17 is not straight forward IMO. MH17 disintergrated in mid air. It did not come down in one piece. How those wing parts came down and at which speed is therefore difficult to estimate IMO. They might have swirled down. I think now there are two main visions; a high speed impact unpiloted and a low speed impact/ditch piloted. IMO there is still no conclusive proof for either of them. I think the Pemba-piece makes a good change of solving this dilemma once and for all. If it turns out it was deployed we have our anwser for the ditching-piloted scenario. And then also another reason for the 0:19 log-on has to be found IMO. If proven to be seperated by flutter we have the anwser for a high speed impact. If it will prove nothing we are left where we are now. I think there are a lot of kippers in the sea; I think that is the main problem. Don’t make it fall on you. As far as I have seen from exchanges here there is no evidence that the simulation in question is from 30 days before, or possible to effectively date at all. We are as it seems (and not to be surprised of) not let in on that level of investigation. It would be strange if we were. Tomorrow the hard facts may change in quality and form. It is an echo chamber. So everything can happen. It is not really for us. It may turn out as a majority decision for all that. Change focus, look to what is palpable. Look to what is for us. My pleasure. I got carried away, but stopped myself from worse. Glad you could enjoy. Sorry, should be Exner, not Duncan. To remind: there are 3, not 2 main possible end of flight scenarios. And, of course, several more variations on these 3 themes. 3. But also, a human controlled descent ending close to the arc in a final high speed mad-man dive. Too often, the discussion seems to focus exclusively on #1 & #2. But #3 is also a possible scenario, and it is consistent with the “pilot did it” assumption AND the steep descent consistent with the final BFO data. No one can claim to know “for certain”. Regarding Larry…I have a suspicion that we are looking at several pieces of inflight separation debris, but I am by no means certain. I have never said there are no other explanations for the flaperon damage. Larry, OTOH, claims to be certain of a water landing with flaps down, etc. That is what makes his statements unprofessional. Like most people here, I keep both scenarios on the table for now. I do lean towards in flight separation as the more likely scenario, based on the limited facts we have. But I am not certain. Larry ignores everything except a few flaperon photos. He is unaware of or ignores BFO data, debris, simulations, etc., and then claims he is certain what happened. That is the antithesis of a professional investigator. I excuse myself to you again for not looking properly. And appreciations by the way. The work you are all doing together is of course remarkable, and bearing fruit no doubt, I want to say that. I wonder if anyone is knowledgable on what could be expected from the parts of the aircraft that could be assumed to sink on impact in a high-velocity crash. There has only been talk of the floating parts and the sinking unbroken ditching hull up until now, I think. I am first of all thinking about the journey minimum 4 km down through ocean water, known deep sea currents, the Ekman layer, relative buoyancy, parts of fuselage thought to hold together even after crash etc. I am feeling for the ATSB folks who now may have to adjust their perimeters from meters to centimetres (perhaps even risking the pixel solution on their bathymetric images?). How many miles away from the crash site could the larger parts drift? Would the FRD and VDR be situated in parts of the plane that could be expected to stick together? Is it realistic to believe that these parts could be found by the instruments at hand at all? Thanks for the pictures. Totally agree with you ,even the engine cowling is ripped off ,re RR logo found on MH370 . So if the recovered parts are really from 370 then it looks like a controlled ditching in which someone could survive until it finally sunk . In that case it should be easier to find a largely complete air frame rather than thousands of little bits. I still worry that the recovered parts are planted to describe the above story with parts having missing ID tags . The search must continue for the sake of all those missing and the travelling public at large. Next Next post: Did MH370 Plunge or Ditch?